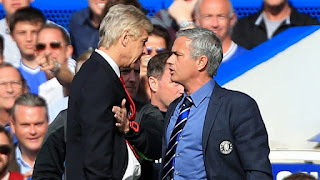 Arsenal manager, Arsene Wenger, has hit back at his Manchester United counterpart Jose Mourinho, that he falsely claimed Alexandre Lacazette would not play against the Red Devils last weekend. Wenger had claimed Lacazette suffered a groin injury during their 5-0 win over Huddersfield and would not be available for the United game. However, the French striker started and scored the Gunners’ only goal during the game. “I don’t want to forget my congratulations to both medical departments,” Mourinho saif after the game. “My medical department managed to recover Matic from a ‘maybe’ to a ‘yes’ [after an injury] but the Arsenal medical department managed to recover a player [Lacazette] from a ‘no’ to a complete 90 minutes. When asked about Mourinho’s comments, Wenger said: “I thought he wouldn’t play but in the end he could play. “What did you want me to do, to leave him at home? “I’m always honest. I thought he wouldn’t play, that was I had been told and after he had a test on Friday morning he went to the game and we were not sure if he would play.